I hate this song. It's called "If I could have a beer with Jesus." What a dumb name. It's like, Jesus didn't drink beer. If he drank anything, it would have been wine. Obvi. Also, does this guy have a black eye under his baseball hat??!!! I think so. Bar fight, I guarantee it. Standard redneck behavior. I mean seriously, this is the kind of song that gives country music a bad rep. I actually kind of like country music (a guilty-ish pleasure) - I even went to the country music hall of fame. It was okay. I found out some things about pop country culture whilst in Nashville. 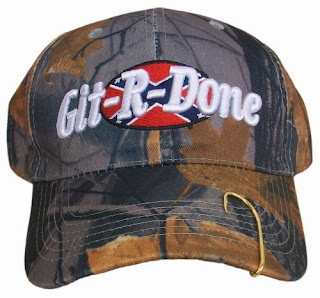 Did you know that country music fans think it's awesome to wear fishhooks in the bills of their baseball caps? I noticed it ever'where. Also, they get fight-y drunk when they drink whiskey (the rednecks). It scares me. Too many country fanatics in one place is fairly terrifying. They are unpredictable. You never know who they might punch in the face next. Point in case: the terrible video I posted above. That guy is borderline famous and even he got hit. Additional groupings that make me uncomfortable due to their unpredictable nature: birds up close, people on hallucinogenics, the elderly. 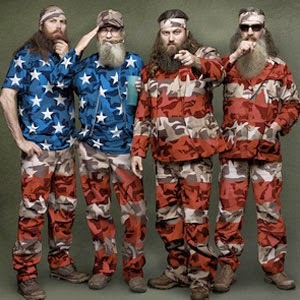 I'm ashamed to say that the Duck Dynasty crew followed through better than my crew did with this concept. We only had three people in our flag and the guy in the middle didn't show up. So me and the other end of the flag had to stuff old rags into the striped jumpsuit that we had painted for Josh (the guy who didn't show up) and we had to carry it around between us all night and it was heavy. Also it didn't "billow" correctly like a flag is supposed to do in the wind. Which was the whole point of the costume. Thanks a lot Josh. You kind of ruined Halloween for me. Forever. Um, WOW to that song. I listened to about 38 seconds of it, that's all I could handle. I too like to dabble in some country music as a guilty pleasure (and because it annoys my boyfriend) but I can't handle all that twang. The fish hook in the bill thing has always been a complete mystery to me. I began listening to country to annoy others as well!!! But then my planned backfired and now I mostly just annoy myself. Woops.